Memorial Day is just a few days away, and if you’re like us, you can’t wait to take a break from the daily grind. While many have made plans that will sweep them off to far flung places like Paris, for those looking to stay local, there are plenty of incredible events going on across all of NYC’s boroughs — rain or shine. 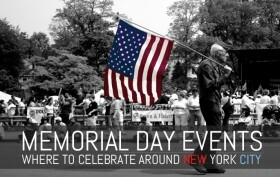 Keep reading for our top events to check out this Memorial Day weekend. It’s going to be a busy few days!